As the Whorl Spins: Coundtdown H Minus 18 Days, Now With 30% More Fibre Content! Coundtdown H Minus 18 Days, Now With 30% More Fibre Content! 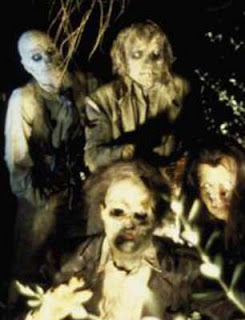 Do Zombies eat their popcorn with their fingers? There has been much spinning going on around here. The cold weather has given me an excuse to stay home and sit at the wheel. (Well, actually, just about any weather gives me an excuse to stay home and sit behind the wheel...but I digress.) 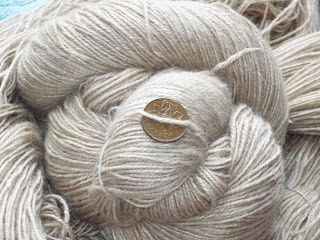 I have been spinning the mountains of Northern Lights into bulky singles, and have only gotten through about 1/3 of that so far--2.6 kg of fibre is a lot more than you'd think it would be when you're spinning it! I have also been spinning some yummy alpaca/silk/cashmere blend roving that I picked up from Alpaca Plus while I was at Fibre Week. There was a bit of VM in the preparation, but the fibre itself is exquisite and it was an absolute joy to spin. And the bits of chaff popped out in the spinning, anyway! Mmmmm....look at that! Here are the stats: 85% baby alpaca/15 % silk and cashmere, 300g, 910 yards, 20 wpi and 6 tpi, semi-woolen. The pictures cannot do it justice! Soft and cushy, with a bit of a halo from the cashmere, this is a glorious yarn. I had been spinning it for a Christmas gift, but now that I have it in my hands, I may have to keep it for myself. Mwahahahaha! I have also been working very hard to avoid my top-secret Halloween project. I finished the prototype and was so frustrated with all of the ridiculous little mistakes that I had made that I had a serious attack of "This too hard for meeeeee!" and set it all aside for about a week. But, stubborn as I am, I sat down last night and took another shot at it. Progress was made and only 2 rounds of tinking occurred, so I'm feeling a little better about it today. I have an evening to myself tonight, so we shall see how things go from here. After all, there are only 18 days til Halloween! Which brings us to today's riddle: Why did the skeleton leave the disco? Let's see if I can manage to give you an answer tomorrow!